Here are 10 vocabulary words to decode for St. Patrick's Day. Great for students in grades 3,4,5 classrooms and home schoolers. 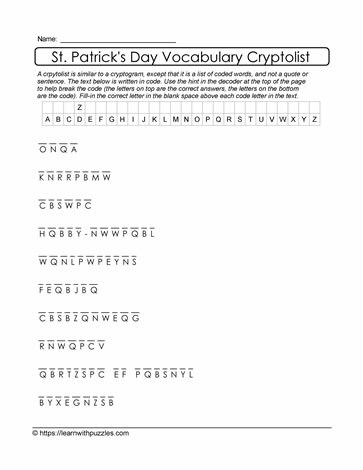 To solve the puzzle, students must decrypt the alphabet code to learn the words. One HINT is given in the grid at the top of the page. Track letters substitutions using this grid.